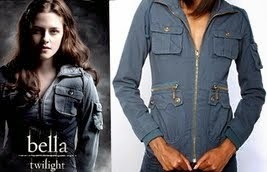 Home » Unlabelled » TOP NEWS - Hell to the NO..Twilight jacket to be destroyed! TOP NEWS - Hell to the NO..Twilight jacket to be destroyed! BB Dakota (California label) was lucky to have Kristen Stewart wear their their $70 multi-pocket jacket in the infamous mega-movie Twilight. Free advertising!!!! What designer wouldn't absorb and capitalise from such phenomenal product placement. Summit Entertainment however wants to pee on their parade..the studio behind the film franchise is NOT happy and filed a lawsuit agaist the label for copyright and trademark infringement,in terms of marketing. Originally sold in 2006 BB Dakota reintroduced the Twilight jacket last year. I think we would definitely keep using this jacket for magnaminous PR!!! Unfortunately, "The Bella Jacket" is no longer on the BB Collective website. Surprise, surprise it's on Amazon (sold as "The Bella Jacket"), as well as Fred Flare (as the "Nicola Jacket"). This is NOT a TRICK and a TRAP..get it now before the Studio KILLS the frenzy. Yup..Summit wants to stop sales and further wants BB Dakota to deliver all remaining Bella jackets to them for destruction. In Whitney Houston words..Hell to NO!